Our new app is an innovative, augmented reality tool that gives you the ability to display our suite of products on your desk; in real-time and at actual size. Gain an insight into how our products will fit in your workplace, as well as an enhanced understanding of their benefits without having to purchase. Wherever you are, and whenever you need to. All that’s needed is a compatible tablet and a printed target. View our monitor arms at actual size. 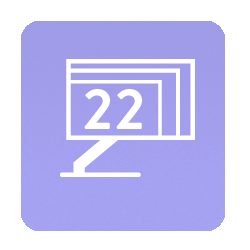 At the click of a button, you will be able to see what three monitor sizes (19”/22”/24”) look like on your desk space, and decide which is optimum. You’ll also be able to peruse different colour options to ensure they’re as aesthetically suited as they are ergonomically sorted. Manoeuvre our products exactly how they would in real life without the need to invest. See what three different monitor sizes (19”/22”/24”) look like on your desk. Cycle through product colour options at the click of a button. Save an image of your AR environment to your camera roll with one tap. View in context before you buy. Our app’s ability to articulate our products through augmented reality is a world-first in the contract furniture industry. And, like all of our other products, the interface design and product articulation was tested rigorously, enabling you to have complete confidence in its accurate and reliable responsiveness. Our AR app is compatible with these devices.